I have a nephew named Railey, and I will never forget something that happened before Melissa and I had children. I was eating Zaxby’s chicken and suddenly Railey, who was a little over a year old at the time, ran up to me all excited. He had never done this before so I remember thinking that Railey was just happy to see his uncle Trey. I then noticed that He wasn’t looking at me at all but was focused on the delicious looking piece of chicken in my hand. Sometimes I think we treat Jesus the same way. We aren’t really interested in Him as much as what we can get from Him. He is a means to an end, and I am guilty of this as well. The point is that Jesus isn’t a means to an end, He is the end. 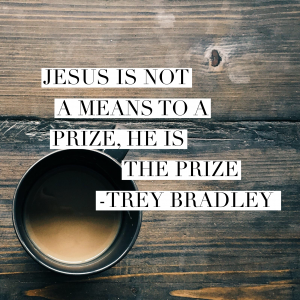 He is the prize! What is amazing about being a believer is having a personal relationship with Jesus Christ and the best thing about that relationship is Jesus Himself. When we share Jesus with others we need to show how great He is and that He is more than just an escape from hell. We should follow Jesus because of a love for Him and not just because we are scared of what will happen otherwise. Now I am not saying that we should leave out what awaits sinners who die without Christ and God’s punishment on sin. That would include having to leave out details about the cross and we obviously cannot do that. I just think that we should emphasize even more who Jesus is and His character. Ultimately, it’s about falling in love with Jesus and this is a game changer because people do crazy things when they are in love. I am willing to sit with my daughter and watch episodes of My Little Pony! Is this because I love My Little Pony? NO!!! I would rather be drug by a car by a hair in my nose for about eight miles honestly. I love my little girl and I love seeing her happy and being with her! It’s the same thing with Jesus. When we focus on Him, and not as much on what He gives us or what would happen to us if we rejected Him, everything would just fall into place. When we fall in love with Jesus and see His beauty and holiness, it changes us and we want to follow Him no matter the cost!